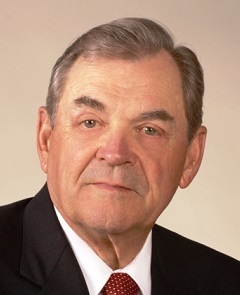 Gerald Julies Bertinot, Jr. attended Cathedral High School in Lafayette and graduated from Riverside Military Academy in Gainesville, Georgia. He later received a degree in history from The Citadel in Charleston, South Carolina. He obtained his law degree from the University of South Carolina in 1965. Upon receiving his commission in the U. S. Army, he served in Vietnam in the mid-1960s and received a Brown Star. He was legal advisor to the Brigade Commander and liaison with the U. S. Embassy legal staff and Judge Advocate operations. After being an advisor for the Courts Martial Investigation, he was assigned to Louisiana to conduct security investigations. He worked for Pan American Petroleum Corporation in New Orleans and later joined the Federal Bureau of Investigation as a Special Agent from 1968 to 1981. In order to help quell the Native-American uprising at Wounded Knee, he was temporarily assigned to Rapid City, South Dakota. From 1974 to 1981, he was a Special Duty Appointee of the FBI as Firearms Instructor and SWAT team member. U.S. Embassy in Kabul, and acted as an advisor to the criminal justice task force part of the Afghan Counternarcotics program requiring him to travel throughout various Provinces of the country making presentations to investigators, prosecutors and judges. In January, 2010, he joined the training staff of IDS International as a consultant for pre-deployment training of military and civilian personnel assigned to Afghanistan. Bertinot is married to Brenda Bertinot.